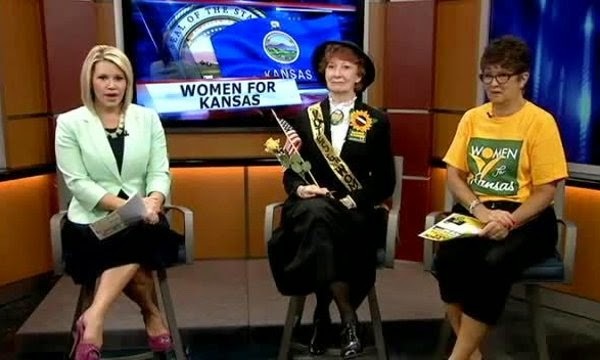 I almost passed out when I received an email with the above photo talking about how "Women for Kansas" were featured on a television news show. I saw the costume -- that hat!! -- and thought, oh no, Brownback campaign. Please tell me you didn't send out the weirdos to shill for your re-election. Alas, the fruits pictured above with KWCH's Kara Sewell are NOT conservatives. I am not kidding you: when I saw that photo, my heart leapt into my throat and my cheeks flushed with embarrassment. And then I read the email. The two pictured are Mary Knecht and Janet Wright, and I've never heard of them. Whew. Crisis averted. Apparently, the "Women for Kansas" are hosting a convention soon with plans to "Take Back Kansas." The Wichita convention promises educational workshops on critical issues (so brainwashing), opportunities to help shape the future of Kansas, a rally lead by a drum line, and a banquet dinner featuring Paul Davis, Jill Docking, Jean Schodorf, Greg Orman, and Rochelle Chronister. So, if you're really into comedy, might I suggest registering to attend? If you don't want to spend $160 bucks (plus hotel, if you don't live close to Wichita), you can attend the TAKING BACK KANSAS PUBLIC RALLY for free on Aug. 29 at A. Price Woodard Park in Wichita. The evening of hilarity begins at 5:30 and will feature the Cherokee Maidens with local singer legend Robin Macy. I am so relieved that those aren't our monkeys, and that event isn't our circus. Seriously, conservatives, rejoice.